So yesterday, I invited a good friend over for breakfast which included crêpes, pancake syrup and butter and what I thought would be a perfunctory discussion of the mother of all hurricanes ever to hit NYC, Sandy. 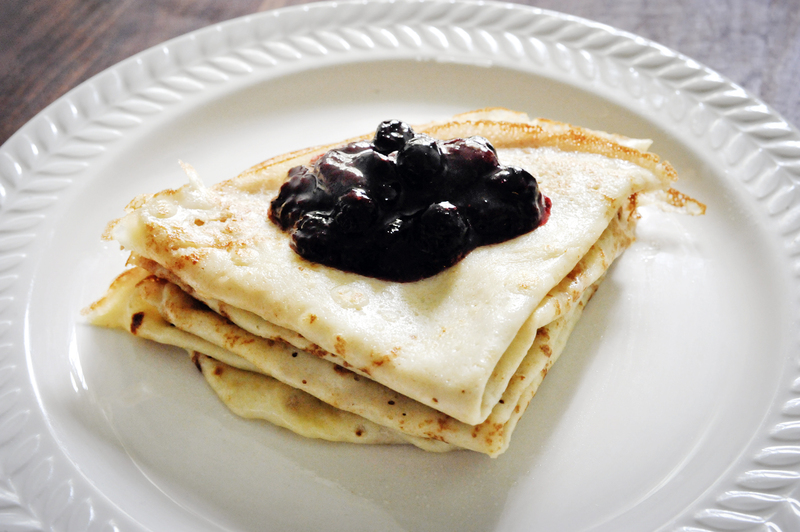 However, after a quick rethinking of what I would consider the perfect condiment, for the crêpes, I decided to make a quick mixed berry compote. (Pancake syrup just wouldn’t do!). What can I say, other then, this was the ultimate indulgence for a French style crêpe. My neighbor (friend) cracked me up after she suggested that she bring over a jar of Nutella. I thought wow! what a great idea! But after opening the jar and observing its contents, I noticed that the jar was in fact empty. All you can do at this point is stick your finger in the jar and retrieve a single fingers worth of Nutella for the licking. (hmm! sounds graphic). I guess she had too much time on her hands and couldn’t resist the creamy hazelnut chocolate tempting her one evening. Well, I might be exaggerating a bit for dramatic effect, but you get the idea. She’s a glutton! But a very nice girl. Well, I thought mixed berry compote to the rescue. I need say no more! This was the perfect accoutrement for my crêpes. So good in fact, that, I had them again today for brunch. Can I get an amen!? Well here’s my recipe. First start by rinsing your berries in cold water. If using strawberries, remove the green tops with a small paring knife. Cut the strawberries in half or quarter. It’s up to you how large you want them. I like a chunkier mix so only cut either in half or thirds. Depends on the strawberries size. Wash the blueberries under cold water and rinse of any debris. 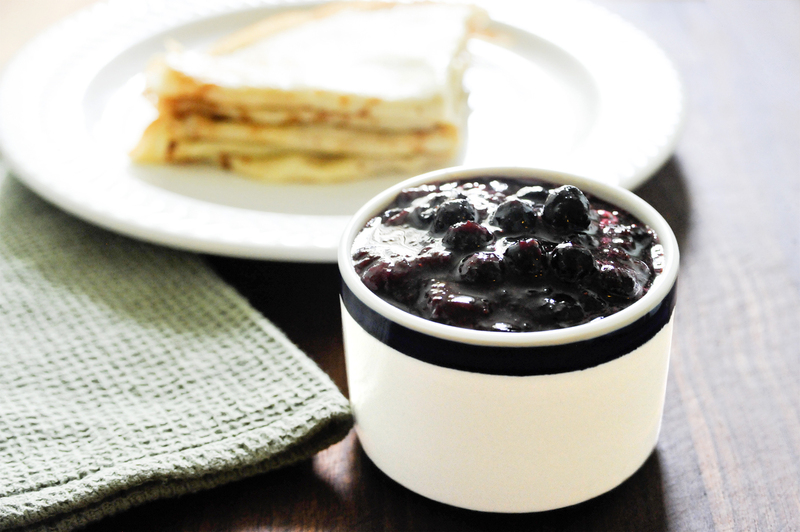 Place the berries into a medium pot, 3 quart sauce pot is what I use or what ever you have on hand. Add the sugar, vanilla extract, lemon juice, salt and cinnamon powder and mix well to combine the ingredients in the pot. Bring to a simmer mixing occasionally to keep the sugar and berries from sticking to the bottom of the pot and ensuring that all the berries cook down evenly. You are looking for a reduction and wilting of the berries. 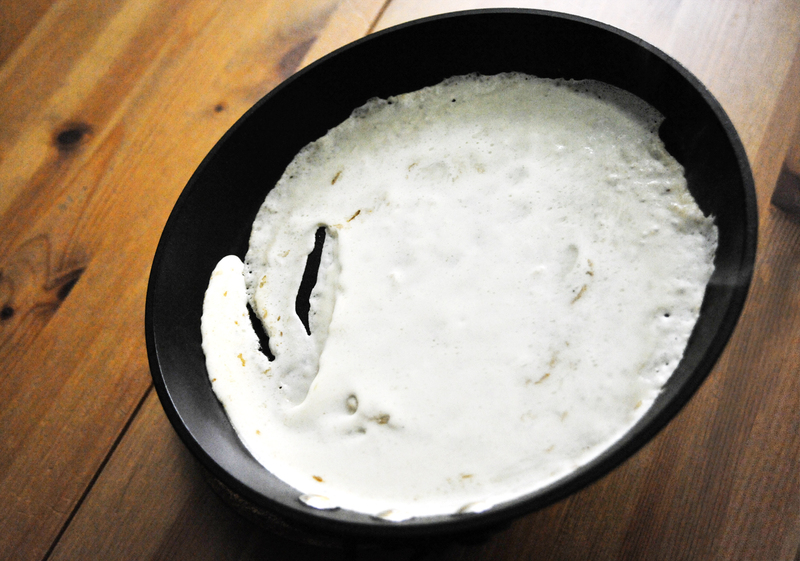 Some foam will form at the top of the mixture once almost cooked. Use a table spoon to remove the foam by skimming the surface. You want a clean smooth syrup with none of the foam. Turn off the heat once reduced and the berries have all cooked. Allow to cool some or use immediately as I do over some freshly made pancakes or crêpes, or your favorite vanilla ice cream. You can store in a ramekin or small bowl and cover with cling film and keep either in the refrigerator or counter top for a few days. It will last weeks in the refrigerator. I plan on using my batch up quickly so I keep mine on the counter. Cheers! So my time at Manzo’s is winding down and I can’t wait to get on to a new chapter in my life. I felt for a very long time at Manzo, like I was stuck on page one. But that’s another story. At any rate, before I left work last night, I had a chance to chat briefly with one of the sous chefs Gerrard, and ask how the Brussels sprouts were prepared. 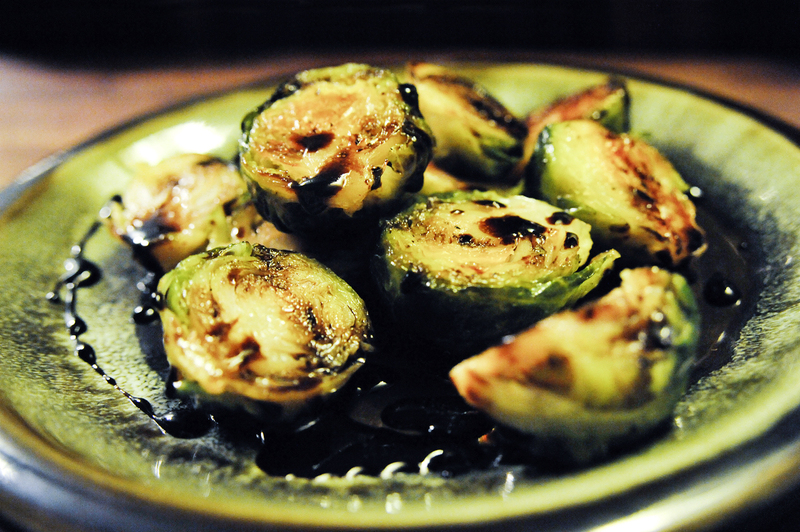 His reply was they are blanched and roasted and drizzled with an agrodolce sauce, made with vinegar and honey. Brilliant! I knew then I had to make these for dinner, albeit late, as is customary for me, so I was not overly concerned. Well as it turns, I actually finished making dinner last night at 2:30 AM. But oh! it was so worth the wait and honestly, who’s keeping time?! 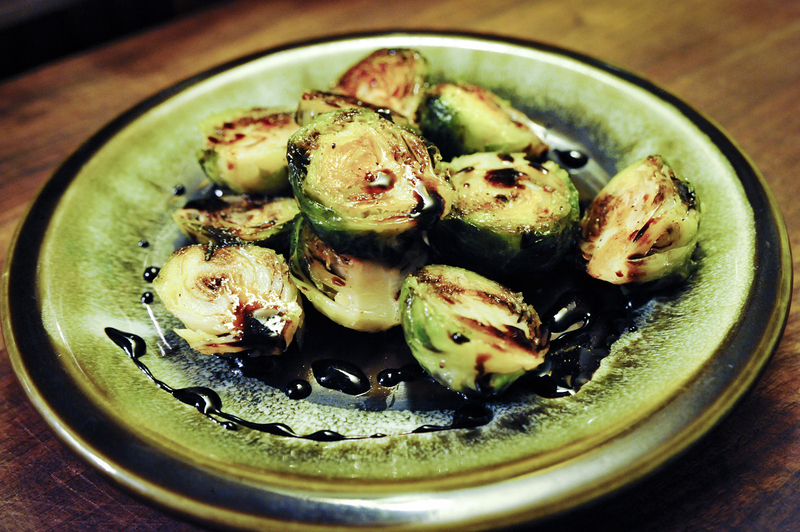 I made this delicious roasted Brussels sprouts with this amazingly simple and quick agrodolce sauce, that I put together with a few simple ingredients I keep in the pantry. It made this dish that much more incredible. Thanks to my sous chef for the great idea and tip. For those of you that don’t know, an agrodolce is a sweet and sour sauce that is made by combining an acid, like vinegar and sugar. I used honey and balsamic vinegar for my recipe, and it was just so damn good, finished with a bit of salt and pepper while cooking or reducing to a thick syrup like consistency. The French call this a “gastrique”, pronounced “gas-treek”. 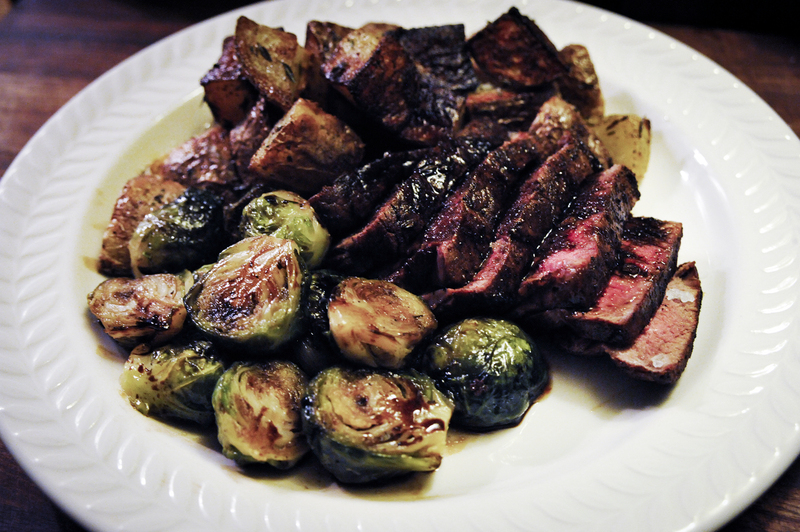 I enjoyed these with a fillet mignon and roasted yukon golds. It doesn’t get any better than this after a long day at work. Cheers! So I was looking for something warm and delicious and at the same time, not too time consuming. I knew I only had but so much time to make a quick breakfast and take the dog out for his walk, and of course, that all ubiquitous reminder that time is fast running out and must get ready for work. (Argh!) So what can I come up with that won’t take up a whole lot of time I ask?! 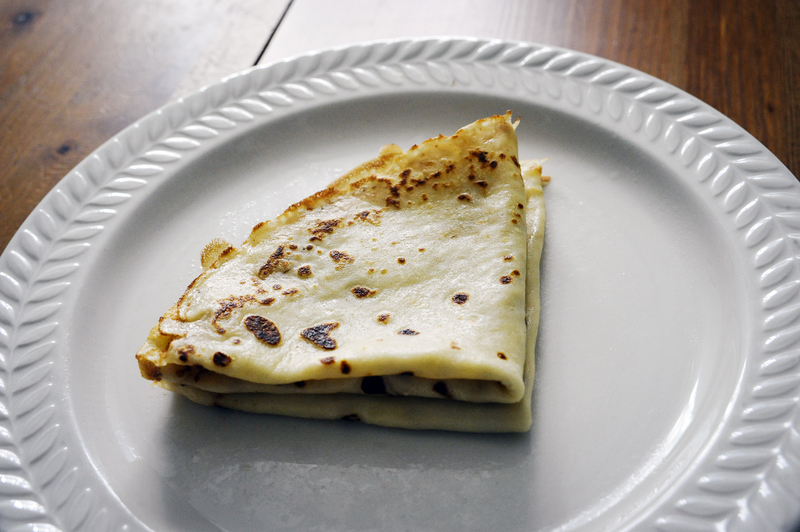 That ah-ha moment (yes I had one), crêpes! How perfect! the thought and idea that is, and of course the crêpes were too. I am happy to report that these were absolutely amazing and took no time at all to prepare. You can have these for breakfast, desert, and even dinner as a savory meal. Here is my recipe. In a large mixing bowl, sift in the flour, sugar and salt. Add 1 cup of milk and 1 egg. You can break up the egg in the same measuring cup you use for the milk and combine the two in the measuring cup and add together. It works better! 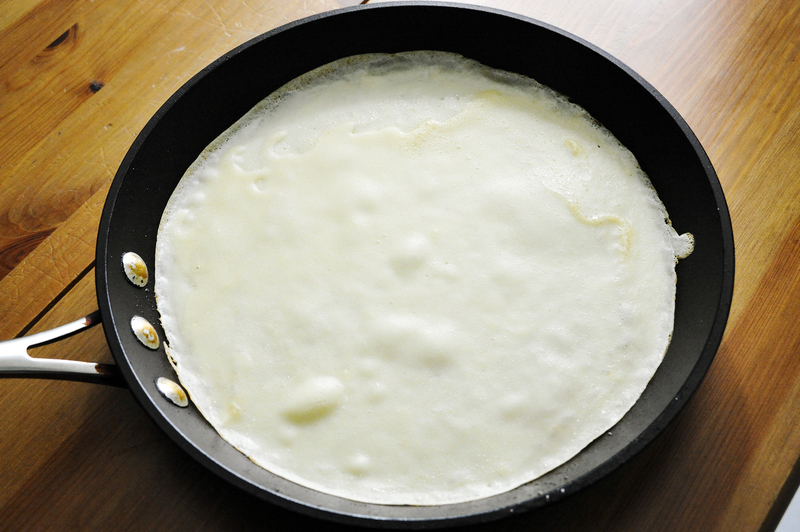 Melt the 2 tbs of butter in a small pot or the crêpe pan and add the butter to the batter. Mix well to combine and create a smooth batter with no lumps. Once combined, add the remaining 1 cup of milk and mix well. 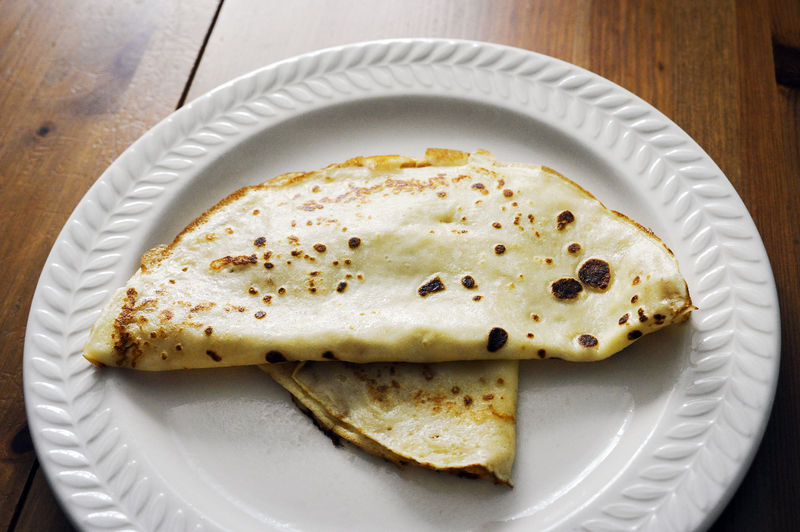 Allow the batter to rest for a few minutes before making your crêpes. I waited just a few minutes (more like 8 minutes), and it was fine. 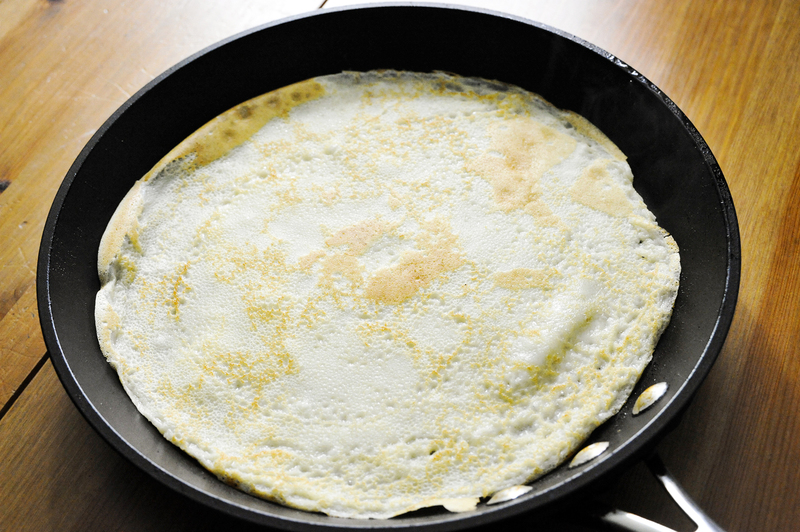 Heat up an 8 or 10 inch crêpe pan and coat with butter lightly. 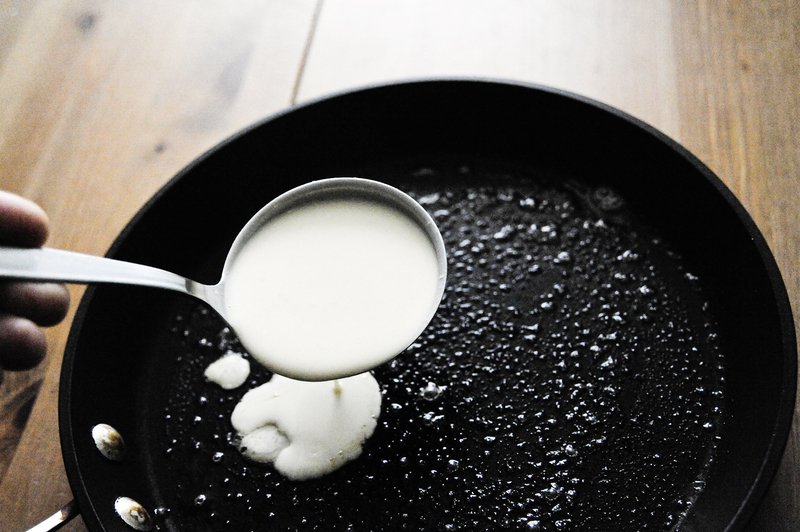 Using a 4 or 6 oz ladle, pour a ladle of batter into the pan and swirl the pan around to coat evenly all the way around to the edge of the pan. You can add small amounts of batter to areas that didn’t get coated. 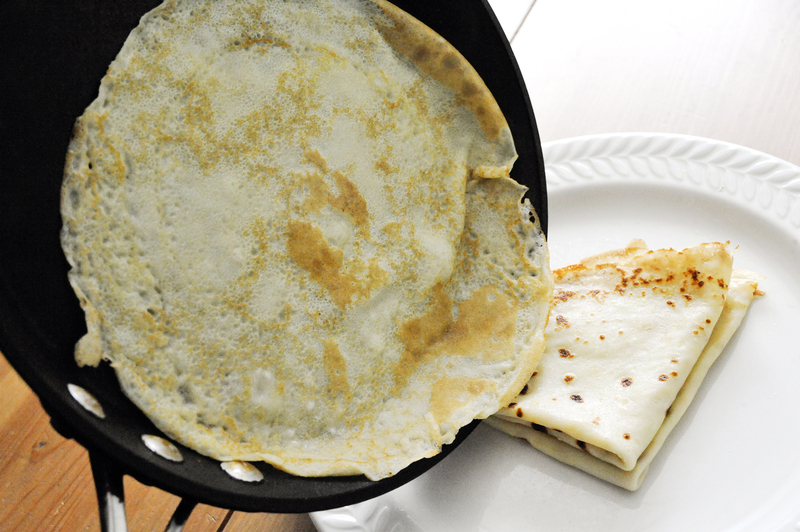 Cook the crêpe for at least 3-4 minutes till lightly golden with caramelized areas or spots using medium heat. 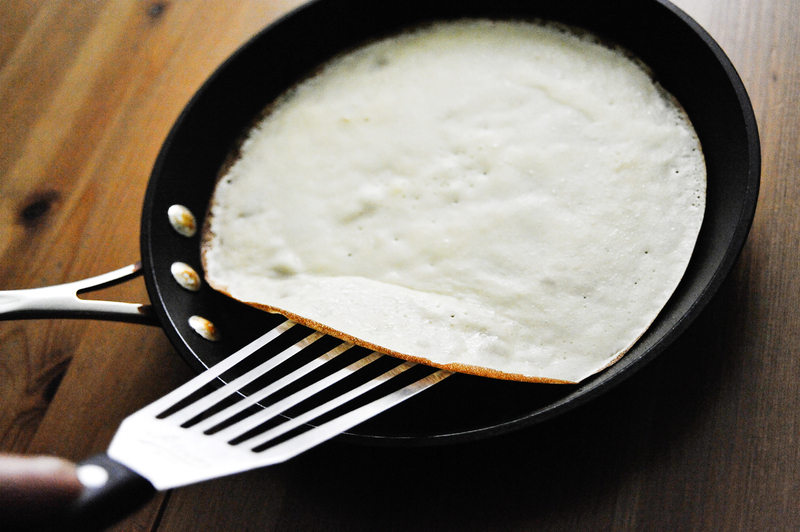 Using a small spatula or fish slice (turner), lift the edge of the crêpe and check for doneness. 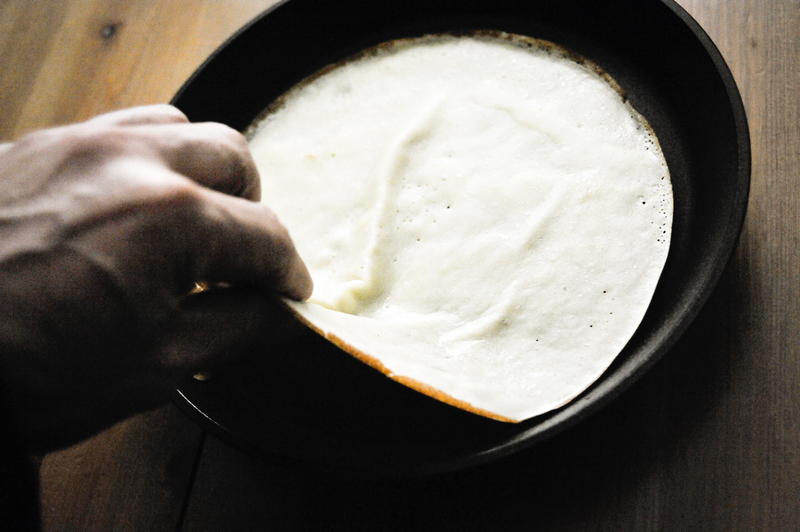 Using your fingers lift the crêpe and flip to the other side and cook for an additional 2 minutes. 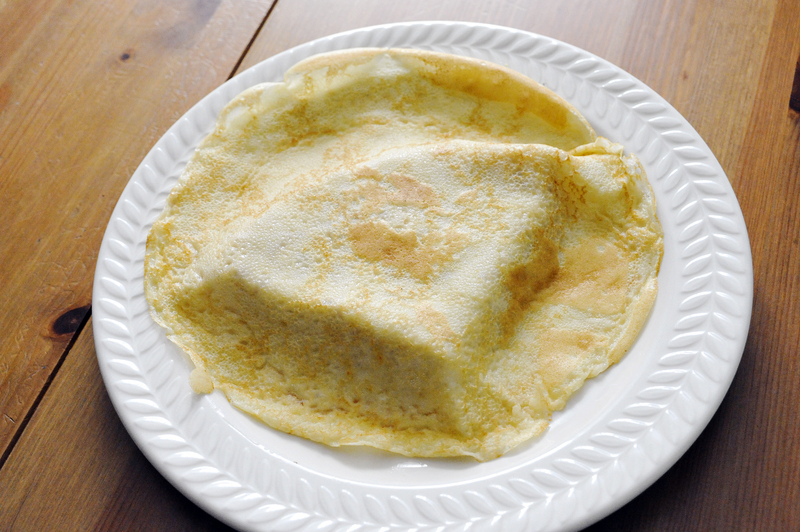 Turn the crêpe out onto a plate and fold in half and then fold again as pictured. 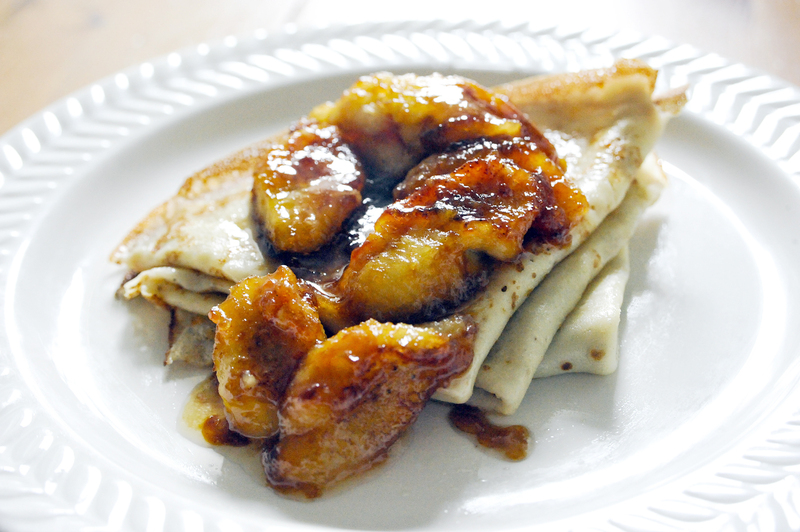 You can garnish with powdered sugar or spread with your favorite jam or maple syrup and butter, or a delicious banana compote. (Shhh! don’t tell anyone, but I used Aunt Jemima). My favorite way to enjoy these, is, with a warm chocolate sauce. 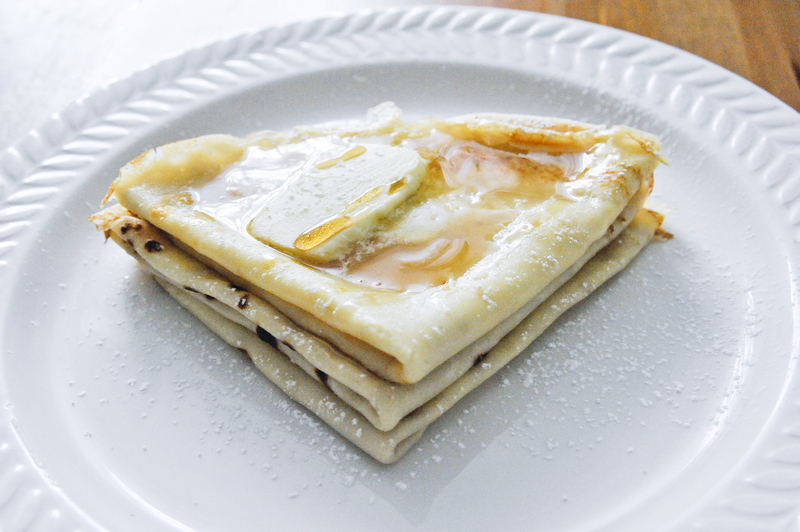 You can make a chocolate sauce or chocolate ganache and drizzle over the crêpe, or drizzle on to an open crêpe, just before folding for a delicious gooey chocolate center. Did I mention I’m addicted to these?! Brings back so many wonderful memories of eating these on the streets of Paris with a very special person. She knows who she is. Enjoy! So the past few nights have been for all intents and purposes, stressful, because of an unfortunate incident that took place recently. But without going into detail about any of it, suffice it to say that, I needed a good home cooked meal tonight made by yours truly. What was on the menu you ask!? 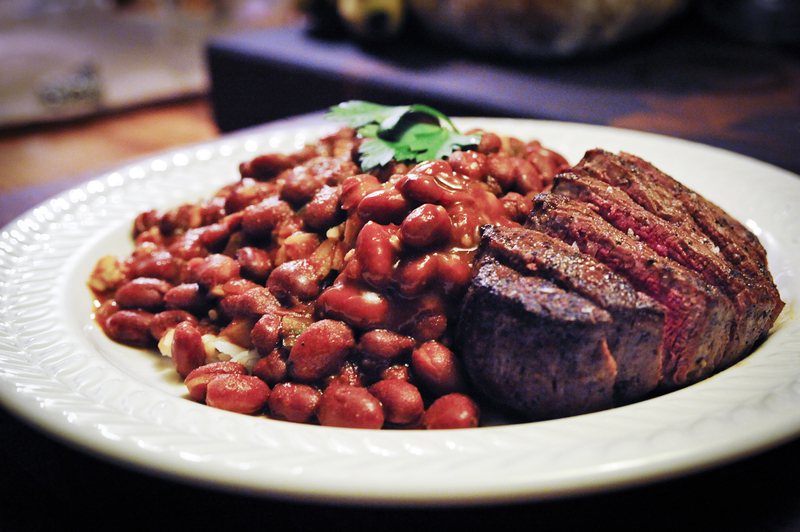 Well in this case, I happened to have a can of Goya small red beans and a 4 oz fillet mignon. And of course, who can forget that ubiquitous accompaniment, a freshly made pot of white rice; made in typical Puerto Rican fashion. It was for me the only way to fly tonight! Lets face it, It’s what the doctor ordered. Well, that of course depends on the meal and the other accoutrements accompanying the meal. Cutting back, this was absolutely amazing and I was happy to make it for my self and very happy to share my recipe with you. This recipe is dedicated to my amazing sister Elaine, whom I love and adore with all of my heart. I am happy I had the chance to see you yesterday. Enjoy! Typically Puerto Rican beans are not made with chipotle or jalapeno pepper, however, this is my take and spin on the recipe. It’s an amazing addition and one you should try. Prep your mis-en-place of onion, garlic, jalapeno pepper and cilantro by dicing and mincing all of the above ingredients. In a 2 quart sauce pan (pot), heat up the olive oil (low-medium heat), and add the onion, garlic, cilantro and jalapeno pepper and sautée for 3-4 minutes. Add the tomato sauce and cook for another 4 minutes. Add salt and pepper and chipotle sauce. Add the small red beans. Now here is where there is some debate as to whether or not to discard the liquid that the beans are packed in or use the beans plus the liquid. I personally use the entire liquid and find that the flavor is more intense and better. The beans release their starch and proteins and the liquid is full of the bean flavor. It also, acts as a thickener. Once the beans are placed into the pot, fill the can with cold water and add the water from the can to the pot. It’s kind of old school cooking and was the way my mom taught me, and I still use this simple yet reliable method. (It just works!). Season with salt and pepper. Lower the heat, and cook for about 20 minutes till reduced and beans are cooked and tender. Check your beans for seasoning during the cooking process. That’s it! Enjoy!